The Oak Inn is an adorable pub outside of Lyndhurst - it happened to be on our cycle route (in fact, it may have been the entire point of our cycle route), and since the cycle hire guy basically said to us, you should make time to have lunch there, we did. We lucked out with the one week of unbelievable sunshine at the end of March, so we sat in the garden, basking in the warmth like the sun-worshippers we are. 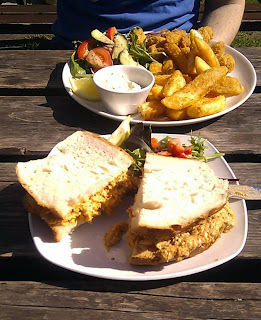 I opted for the fresh Lymington crab sandwich, while A had scampi and chips. Both were absolutely perfect and everything you could want from a country pub. I was surprised by how generous the crab filling was, as I know how hard it is to get that much crab when you're picking out tiny shreds of flesh from a craggy shell, so not only was it tasty, it was a bargain as well. Anyone wandering in the New Forest should make sure to stop by!